Artist Stella Tooth joined the occasional series on motherhood and creativity on www.storyofmum.com, sharing how her art links to her experience of mothering, and talks about her upcoming group exhibition “Motherhood”. The exhibition by the Lots Road Group takes place at the Chelsea Library, Kings Road, SW3 from Thursday, 20 March until Mother’s Day (30 March). 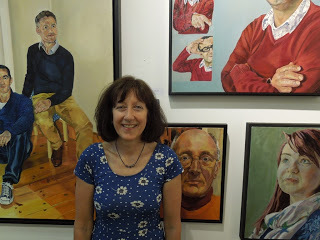 The exhibition is accompanied by a book which contains all the portraits featured in the exhibition which are executed in a variety of media from oils, acrylics and pastels to print. Some were completed from life, others after death from studies and photographs. The book will be sold at the exhibition in aid of Oxfam’s Mothers Appeal. The Heatherley School of Fine Art’s Principal Emeritus, John Walton RA, writes about the portrait he painted of his own mother in the foreword to the book.